Q. What’s the best way to store dried spaghetti and other long pastas so they don’t get buggy or stale? I’ve always kept them in their original boxes but lately have had a problem with bug infestation (ugh). I don’t want to use glass containers since I’m afraid of breakage so I guess that leaves plastic but I’d want the BPA-free kind. Any suggestions? A. I recommend the Progressive Pasta ProKeeper. It’s crafted from BPA-free plastic with an air-tight silicone seal that keeps stored pasta fresh and safe from bugs. (Tip: Bay leaves are supposed to repel pantry bugs; there are many claims that keeping a bay leaf in with your pasta will deter insects.) 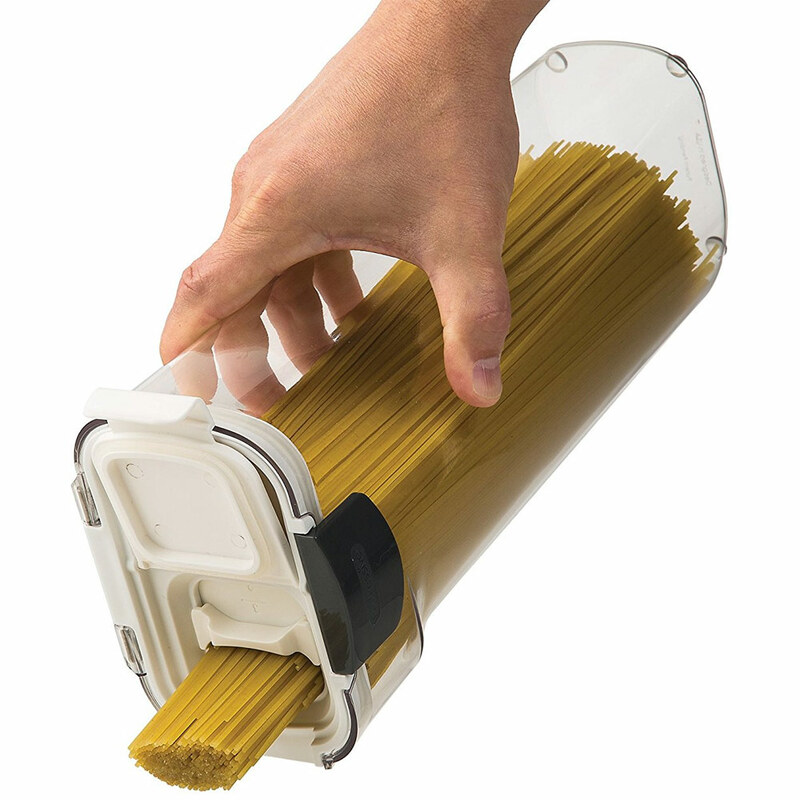 The container also features a unique body shape that funnels pasta toward the spout for easy dispensing. With an approximate 2.36-quart capacity, this pasta keeper can hold up to 2 pounds of spaghetti noodles. The hinged lid swings back so you can easily access the inside of the container, and the snap closure keeps the lid secured. The lid has a sliding door so you can measure out 1 to 3 servings of pasta. This entry was posted in Answered, Kitchen Organization by Harriet. Bookmark the permalink.